Bruce Lee – a man, a legend and now, it seems, an iPhone game. Can this new app from Indiagames live up to the reputation of the most famous Martial Arts master in the world? Things start well, a grainy looking title screen brings back memories of those classic Bruce Lee films and a suitable oriental theme song plays in the background, setting the scene nicely for what is to come. The game offers 6 modes from the off; Story takes you from Lee’s training with a Grand Master right the way through to his film career, cut scenes progressing the story nicely, particularly as they sometimes move straight in to the action without pausing, which adds to the feeling that you’re actually playing through the great man’s life. It’s a genuinely interesting journey through the Dragon’s history. Arcade and Time Attack modes do pretty much what you’d expect and do it well with Arcade in particular being a strong area of the game, allowing you to delve in and play with all the characters you’ve unlocked (from the 10 available) in a few seconds. Versus mode is a bit of a let down, you’d expect it to be multiplayer but in fact it’s just you VS the AI. You do get to choose the fighters and venue but that’s about it. Survival mode gives you a set of one round fights with harder and harder opponents, a staple of most fighting games. The most striking thing about the game is the visuals. This is a 3D fighter in the same vein as Dead or Alive or Tekken. 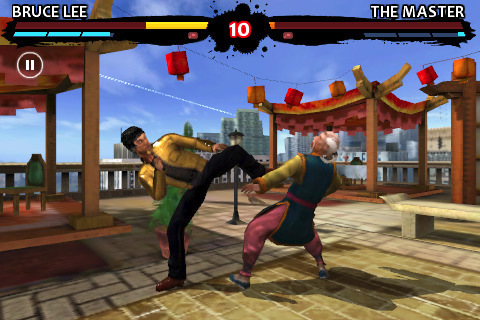 The fighters have been meticulously animated with their own unique moves and facial expressions, but more than this it’s one of the most visually impressive games on the iphone so far due to the detail in the backgrounds. Birds fly overhead, confetti rains down, leaves on trees blow about as you trade blows with your opponent. At times it’s pretty magical. Controls are simple, maybe too simple for those who have sampled the delights of Street Fighter IV. The virtual pad works fairly well, it feels more like a digital pad at times but it does allow for side stepping. The game disappointingly only offers one punch and one kick button which limits your moves a little. You can, however, kick high and low and even perform jump kicks which are very satisfying when they land a blow. Allowing for side stepping and counters is the key to the game and learning the rhythm required to progress can take time, in this respect it’s not like any other fighter on the platform. Initially frustrating, practice pays off and in a way this reflects what the great man was all about; perseverance and practice. Despite this, it never feels like a chore to play even when the going gets tough towards the last few matches. Unlockables come in the way of art, both photos and game art screens, which can be viewed at any time. It’s a nice touch and something to aim for when completing the story mode. The various photos of the man himself are a welcome addition to the overall authenticity of a game that celebrates the legend of Bruce Lee. Does this, then, take Street Fighter IV’s crown as the best iPhone fighter? Not quite. Although the subject matter may make it instantly appealing to fans there are a couple of points that let the game down. The first and most important of these (for me, at least) is that the game takes time to respond to your button presses. It’s not unresponsive as such; it just goes through your button presses in order, even if you’ve fallen on the ground. It’s a weird concept to get your head around. Where other fighting games rely on immediate moves and counters this requires you to think ahead. When it works it works well but it can be frustrating. The second point is the lack of multiplayer, even local. In this day and age a fighting game without a multiplayer is like a snail without its shell (ok, that’s a slug, but you get the analogy). AI multiplayer of sorts does allow some sort of challenge but it’s no match for a human player. Despite this Bruce Lee Dragon Warrior is a great game and a worthy addition to the growing number of fighters on the iPhone. It shows that 3D fighters are possible and it’s a great homage to the Dragon himself that he finally gets a game which celebrates his life.